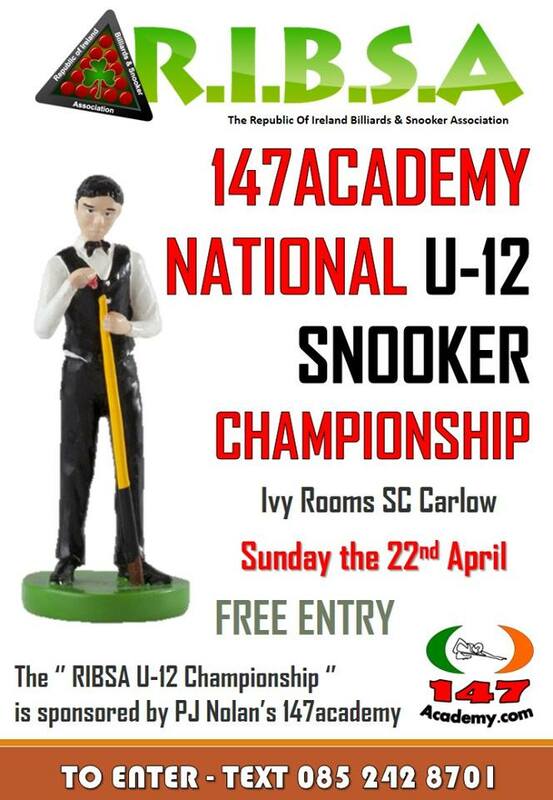 The fifth running of the RIBSA Under 12 National Snooker Championship sponsored by The 147 Academy of PJ Nolan will be held on Sunday the 22nd of April at 3pm. The U-12 Championship will be held in the Ivy Rooms Snooker Club in Carlow along with the Under 21 Championship on the same day. This event is open to any player who is under 12 on the 31st of December 2017 and again there is free entry to all the players but Proof of age is required on the day. You can now text your entry to RIBSA on 085 2428701. This is a text number only and you must include your name, club and the event you wish to enter. The defending Champion is Leone Crowley from Shooters SC Cork who will be hoping to defend the title he won last year.